Regular updates forthcoming. 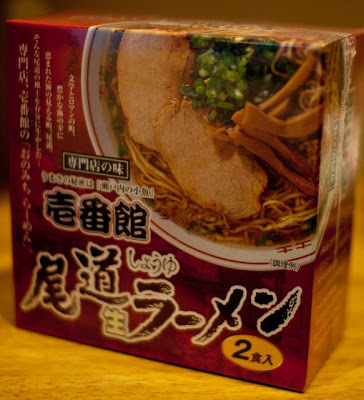 But in the meantime, I picked up this gift ramen from famous ramen town Onomichi. Having crushed my share of bowls in said ramen destination, this one is for you! To win it, just head over to the Ramen Adventure Facebook page and either "like" or leave a comment on this post. I will choose a winner randomly on January 7th. As long as shipping and all that works out, I hope to have regular ramen contests in the coming year. I had a few minutes to kill while my laundry did its thing. Local tantanmen shop Tenho has been on my radar for a while now. Great chance! Very crowded on the Emperor's birthday, a national holiday. At lunch, it's strictly noodles. I went with the No. 1 choice, tantanmen. I've been searching, albeit lazily, for a great tantanmen shop in Tokyo. A few were good, but so far nothing is remarkable. It may be necessary to start going to expensive Southern Chinese hotel restaurants to find it. Not quite there yet though. Maybe next year. Totally normal. The addition of umeboshi was something new. Interesting. A pickled plum in spicy soup... not so good. Maybe the crowds were there for an end of the year drinking party. Soranoiro, which probably means the color of the sky, is a recent winner of a whole stack of awards. November is ramen magazine month in Japan, for some reason. Ramen no Hon, Sugoi Ramen, Kami Ramen, and Ramen Walker, to name a few. It seems like the names behind all of these magazines get together and crown a few winners the following month. To sum it up, the chukasoba is standard, using very high quality ingredients. The veggie, on the other hand, gets all crazy. The noodles use paprika to give a bright orange hue. And the soup is pureed with a few things, though the carrot was the dominant taste. Subtle undertones of scallop and salt are there, but really the carrot is what you will taste. Expect a wait. And with over 50% of the menu being lighter, healthy choices, expect an even ratio of men to women. Someone let me know how the standard shoyu is! Just around the corner from a shop I had on my list, named Bori, happens to be a shop with some minnor buzz about it. The only reason I wanted to go to Bori was because they have a Bob's Big Boy out front. It doesn't take much to get me to a shop. But the appeal of actual good ramen was stronger. The shop's recommendation is their slightly expensive niku yasai tsukemen. Meat and vegetables. Vagueness is a common theme on these ticket machines. The noodles are made on-site. And here you have it. A fairly standard tsukemen. The stand out feature was a spicy undertone. Nice lunch! But there's more! A separate plate, piled high with meat and vegetables. Unfortunately, in the ramen dictionary, vegetables means nothing more than bean sprouts and cabbage. But the masses of meat made it special. But there's more! The flame grilled hunk of pork is great. Full would be an understatement. Stuffed would be going too far. But there's more! The chef brought over a bowl of what looked like salsa. A bit more spice, and a taste of home (San Francisco Mexican food). But there's more. Soup added along with with rice to make what was described as risotto. More like rice-in-soup. Along with the noodles and plate of veggie-meat madness, this would be meal #3. Great taste. By this time, the added spicy salsa, bits of leftover meat, and vinegar makes a nice 3rd meal. Seriously, this was a lot of food. But there's more. About halfway down, the chef came by once again and spooned in some sort of chili. The ramen chef interfering with our lunch 3 or 4 times was unexpected, and welcome. Get the smallest size though. Seriously. You might pass by this shop and wonder, what does a seafood skewer shop do for lunch? I mean, the menu, the photos on the walls, it all points towards drinking and eating pieces of grilled fish. The grill, though, was definitely off at noon on a Tokyo weekday. This inviting little shop does what some other place do (Zoot comes to mind) and serves ramen for lunch. Being a seafood joint, the ramen has shrimp in it. How much shrimp? Tons. There are 2 pieces of *yawn* normal shrimp, mounds of both sakura ebi and some kind of brown shrimp fry, and a couple excellent shrimp wontons. Of course, the soup is flavored with shrimp. Digging a little deeper, the soup is actually made with Malaysian Belacan, a spicy blend of fermented krill. This is one unique bowl! And at only 500 yen, an amazing value. I went with some optional toppings, as recommended by the staff. The cheese is unnecessary, as there is too much going on in the bowl already. The curry powder, on the other hand is good... if you like curry. Once again, a lot is going on in this bowl. The vibe is great, and I'll be coming here for dinner sometime. Can't eat ramen every meal! Ikaho Onsen is just another of Japan's many hot spring resort towns. A little dated, but if you are looking to relax in some mineral-rich onsens, this is a place to go. And as with Japan's many hot spring resort towns, food is a major draw. The shop's master advised us against the ramen, suggesting the locally famous udon instead. The scent of mirin was strong, mostly from the heavily soaked menma in the bowl. Not a bad bowl, simple and hot. The shop owner told us that we were the first adults to order ramen in a long time. Ramen... a kid's food? I don't wanna grow up! As expected, the udon was better. The train arrived at Minakami station with an hour or so to spare. Waiting for the shuttle bus to the remote mountain hot spring would be no problem at the local cafe. But the allure of ramen is persistent, and when you put more than 1 ramen maniac in the vicinity of each other, it was impossible to resist. This shop, like the crumbling old town it lives in, seems ancient. Is it ironic that the old bill-of-health certificates look like something out of a zombie flick? If the daruma's wish was for some horrid ramen, then I guess it makes sense. Five's God Factory for those of you without a dictionary on hand. This has got to be a reference to something. Language buffs help me out here! Despite the cryptic name, this shop is hot on the ramen scene. They boast one thing, and one thing alone. Shrimp. The place positively reeks of shrimp. Reek, reek, it rhymes with good eats. There is a lot of draw in that sweet smell. The menu is on the large side, with a shrimp miso and a shrimp tomato tsukemen being the top sellers. If the aroma of the shop wasn't a dead giveaway, the taste sure is. Pure shrimp goodness. Artfully topped with a dollop of pesto and sliced baguette, this is another bowl that is trying to break into new territory. And with one of the recent ramen magazines declaring 2012 as the year of shrimp ramen, Gonokamiseisakujo is poised to be one of the top shops in town. Or maybe it's just a fad. Last year's declaration of "beef ramen" was a bust, and I'm sure next year's "turkey noodles" will be no more than a 4 page magazine spread. A recent adventure to booze-spiked Koshi had me wanting more. More alcohol in my ramen! Kono's original draw was just that. Forget the noodles, just look at this menu. For a mere 300 or 500 yen, you can have a glass of choice tequilla. Nice price! And in a country that doesn't know the difference between blanco and anejo, this selection is amazing. Being 11 in the morning, I abstained. Sort of. The shop's special bowl, the R-20, includes a shot of the stuff. Sorry kids and drivers! Yeah, you should be skeptical of this bowl at first. Seems like a gimmick. But the tequilla, the cilantro, the lime... it melds with the shio broth perfectly. Any other soup, shoyu or miso for example, would be too much. And I think tonkotsu-gyokai would pair better with a nice scotch. It's hard to review this bowl without making wise-cracks, so I'll just say that it was great. And yeah, I felt tipsy after eating this. A shot of booze in the morning will do that!